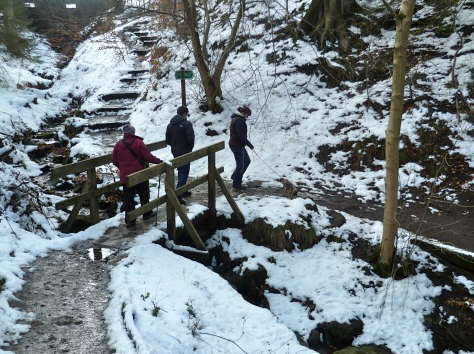 Today’s picture, sent by Bruce, shows Guthrie walking his owners in Sheffield during the recent snow. He should have stayed at home because it was much nicer here. I got up into my cycling gear as the forecast had promised reasonable weather early with rain later and I was very disappointed to find that it was raining already. 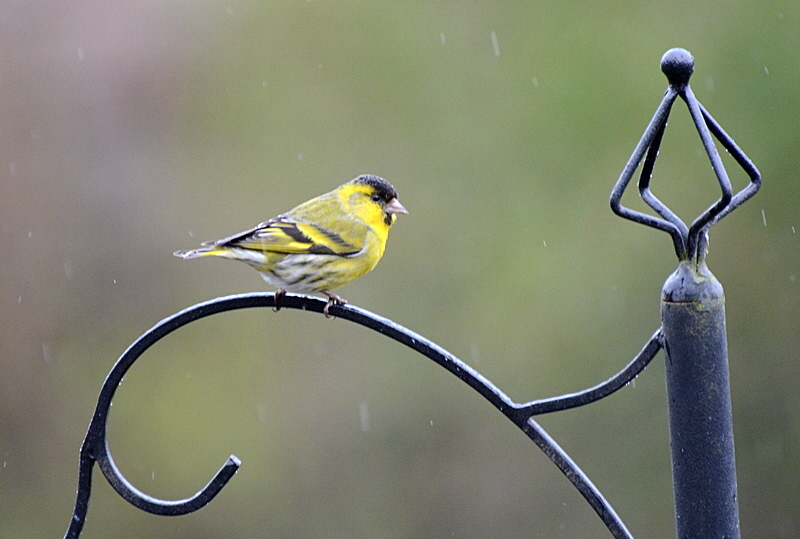 A siskin muses on the early weather conditions. 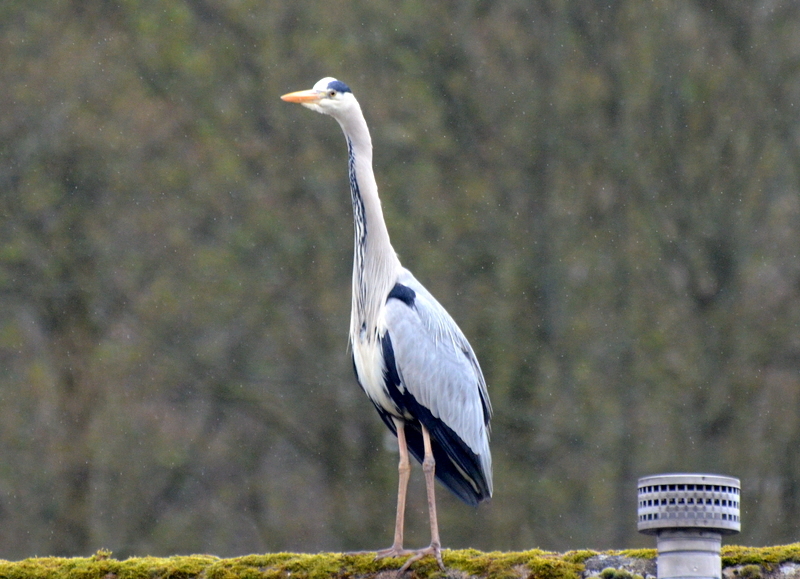 We had a brief flying visit from the heron who stood for a moment of Florrie’s rooftop. I had a subdued breakfast and when Mrs Tootlepedal left to sing in the church choir, I told her that I would be changing back to everyday clothing and sulking while she was out. 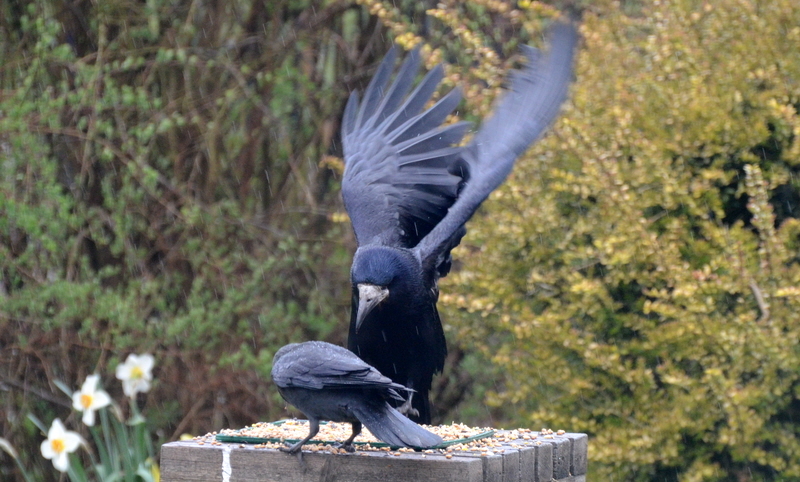 This rook didn't look too happy either. However when I poked my nose out of the door before going up to change, I found that the rain had stopped so I stopped sulking and got the speedy bike out and set off down the A7 southwards which is the flattest route out of town. There was a light breeze and it was warm enough for April and I soon shook off the morning aches and pains and started enjoying myself. I had been intending to turn round after ten miles and come back up the main road again but there was a fair bit of traffic about for a Sunday and I felt good so I turned off onto a side road and headed across country back towards Glenzier. 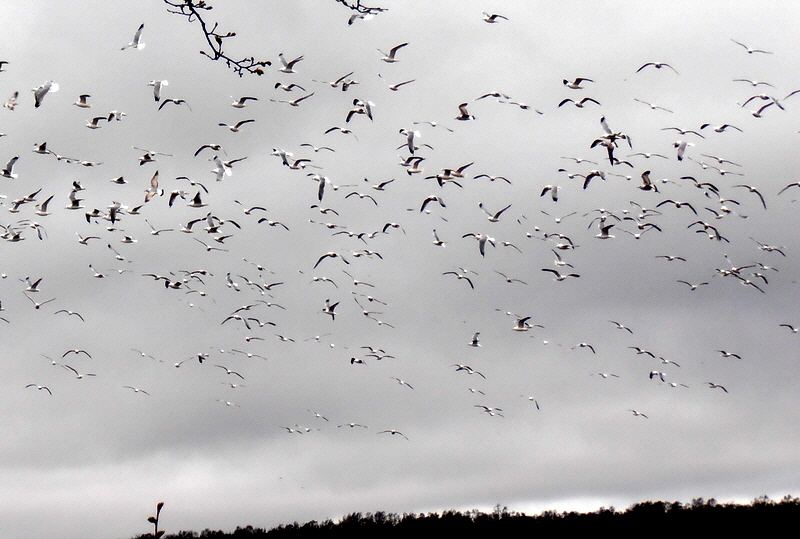 I had the little camera with me and took it out when the sky filled with birds. 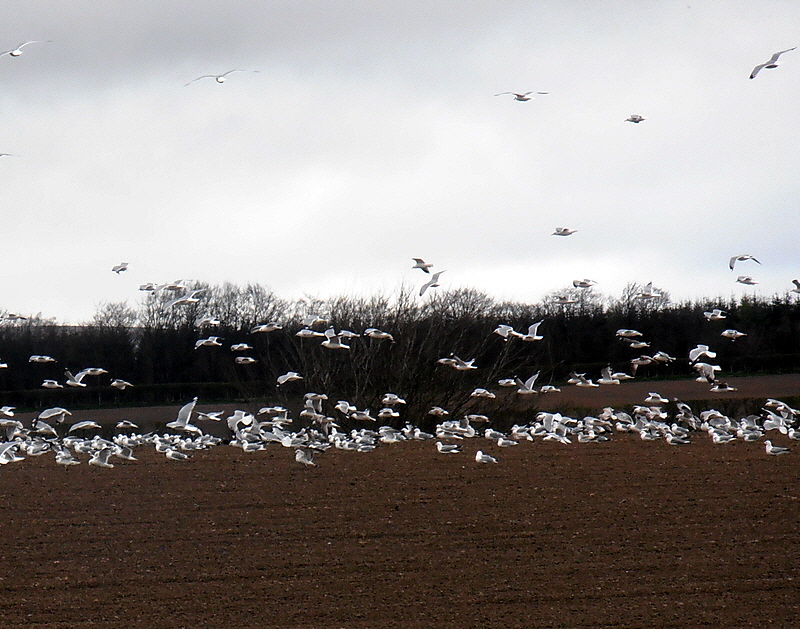 It was a flock of gulls which had risen from a field as I approached. They soon settled back down again. 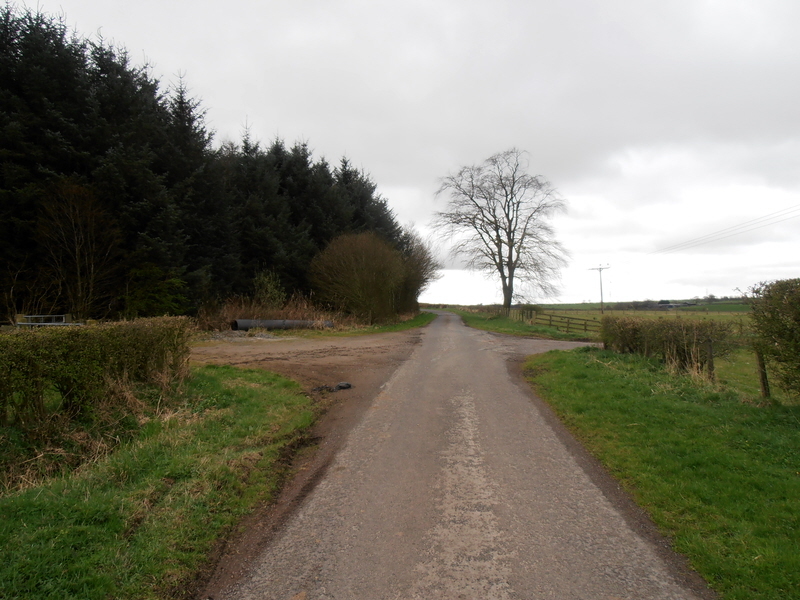 Shortly afterwards, I crossed one of the heavily guarded border posts between England and Scotland. There are no signs here and only way you know you have entered Scotland is because the road gets narrower and more poorly maintained. Once I hit the Annan road, the light breeze was behind me and I was able to keep up a reasonable pace until I got home. It had kept threatening to rain but had always stopped after a few moments so I had a very pleasant run. The trip worked out at 23 miles which a little further than I have been doing lately and I felt well enough at the end of it to imagine that I might try for a thirty mile jaunt soon…if conditions are favourable. It is not sensible for me to pedal in really strong winds or very wet conditions just yet. I had a light lunch and sieved a couple of buckets of compost. We have been using the compost to help level up the new bit of lawn and it has made that grass look so healthy that we are trying out what spreading a little on the old part of the lawn will do. The grass under the plum tree, where it has been fertilized by a hundred chaffinches all winter, is looking amazingly good so there may be a lesson there. I had a look for flowers. 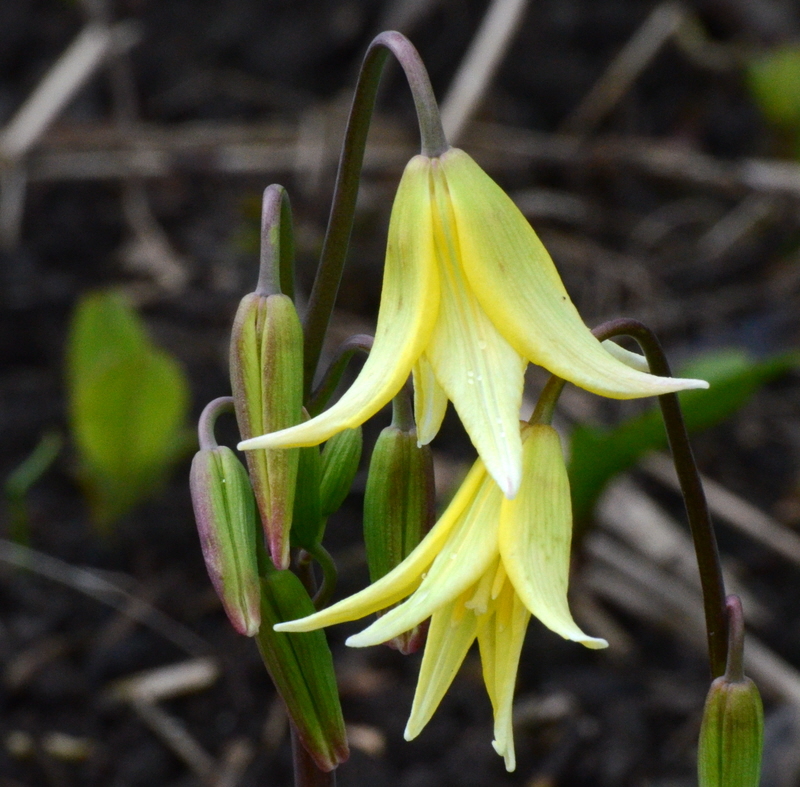 There are a lot of dog tooth violets in the garden and they have come on well. There are also a lot of potential tulips. 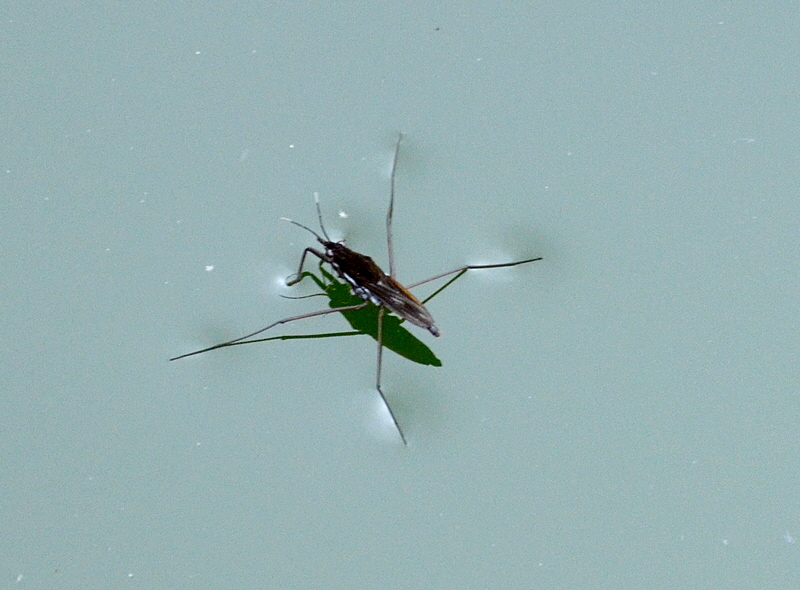 The pond is very short of tadpoles but the water skating insects have avoided the marauding ducks. 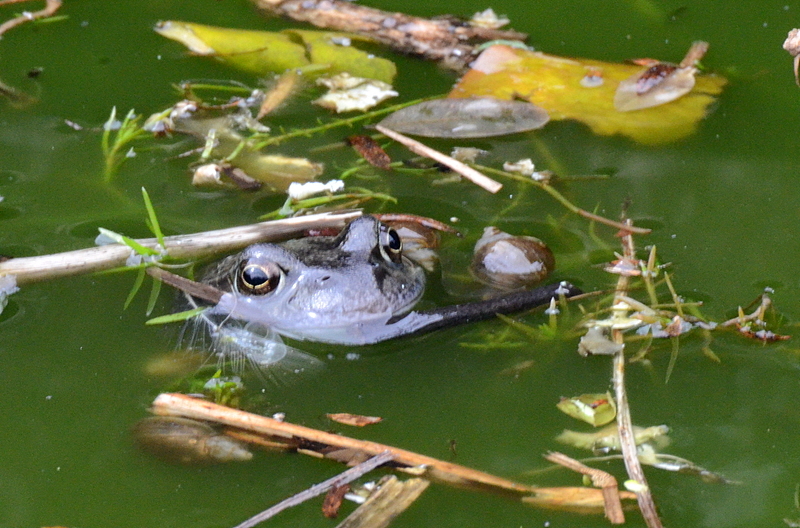 And there is still at least one fully grown frog about. Since she had come back from Church, Mrs Tootlepedal had devoted her day to gardening but now she settled down to some quilting and I took my camera for a walk along the rivers Wauchope and Esk. 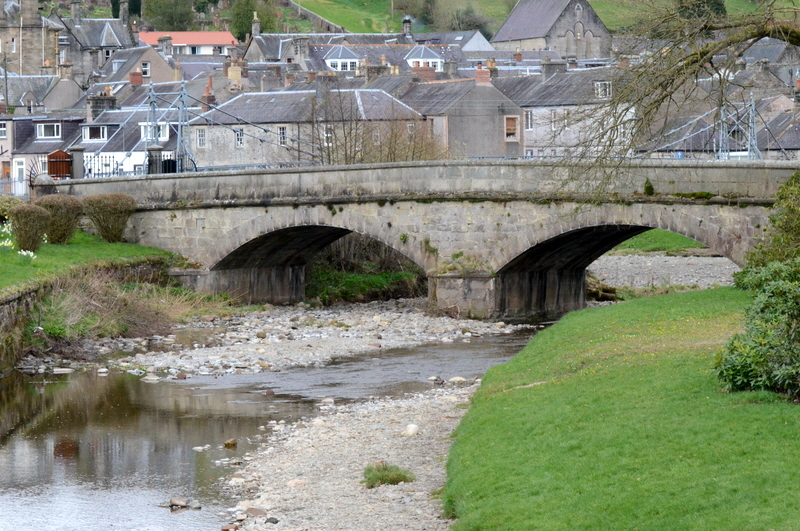 The Wauchope is exceedingly low after the dry spell that we have had. 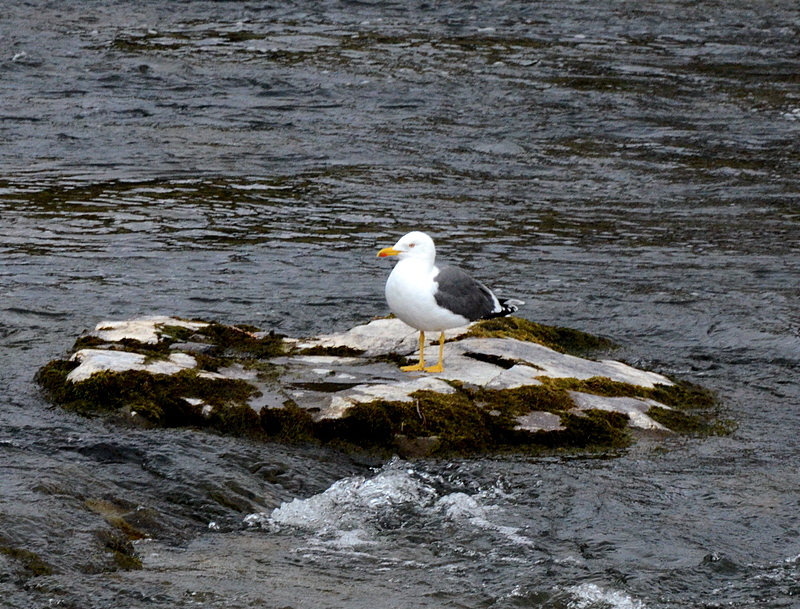 There were two herring gulls sitting on rocks in the middle of the Esk. They won't find any herrings here. 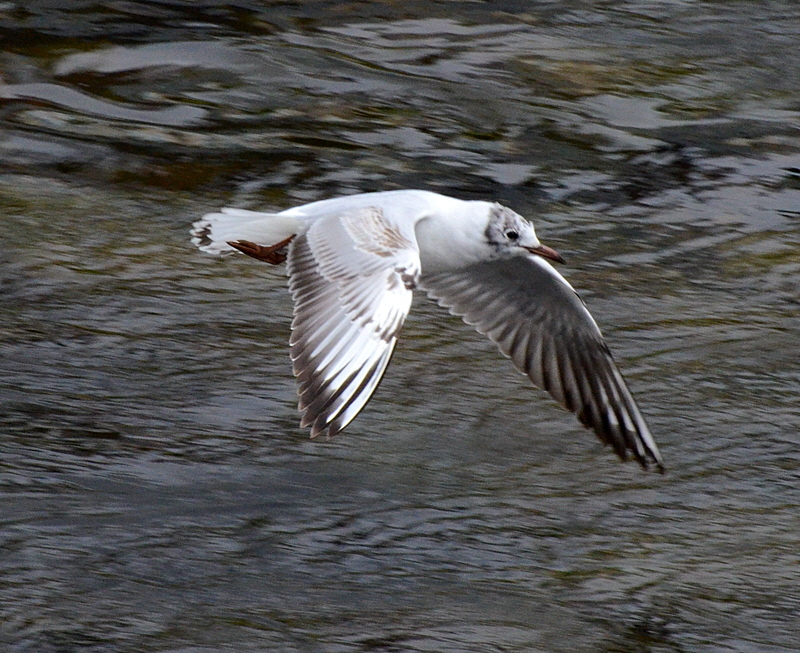 The more normal gull for us is the black headed variety like this one which I captured flying up the river. 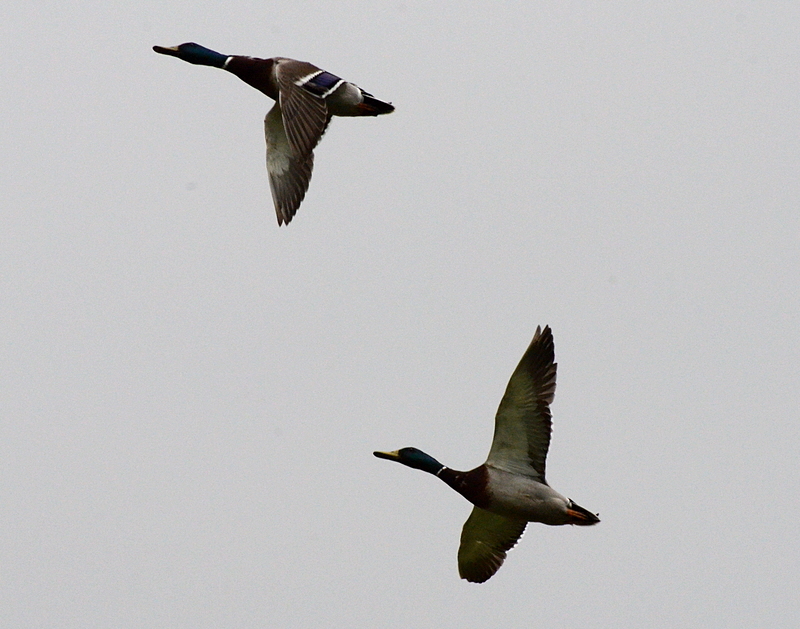 Most of the ducks are in pairs now so these two males flying by are probably on the look out for a lone female. 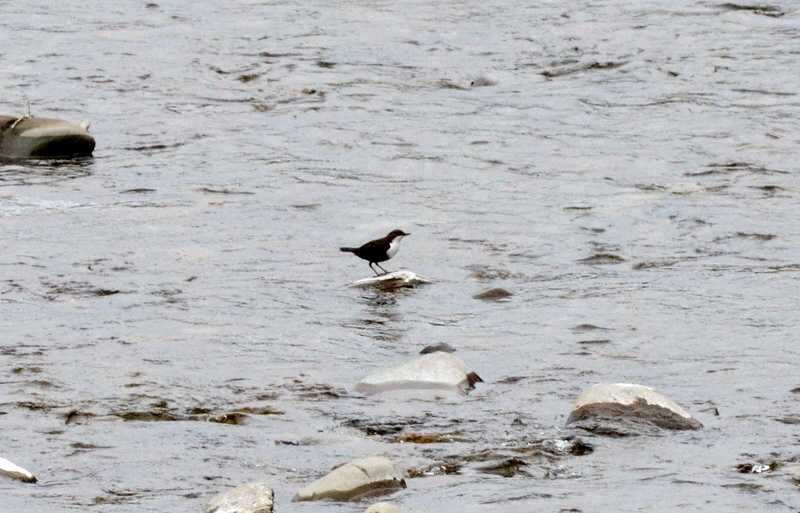 I had seen a dipper at the Church Bridge but it had flown off before I could unleash the camera so I was pleased to see another near the sawmill bridge, even if it was a little too far away for the perfect shot. It is having a rest for a moment in the middle of some very energetic dipping. 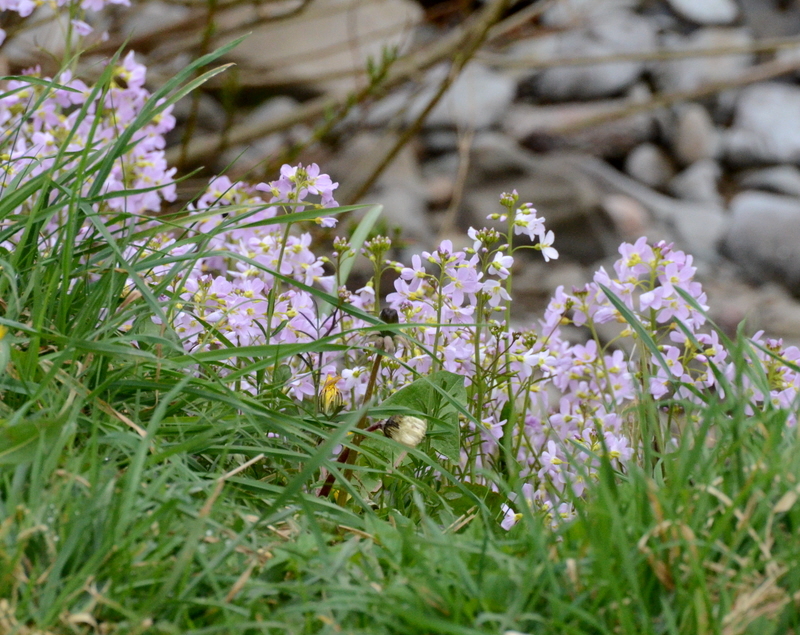 I went back home down the Esk along Elizabeth Street and realised that the daffodils on the river bank had been joined by a host of little pink flowers. Mrs Tootlepedal tells me they are Lady's Smocks. 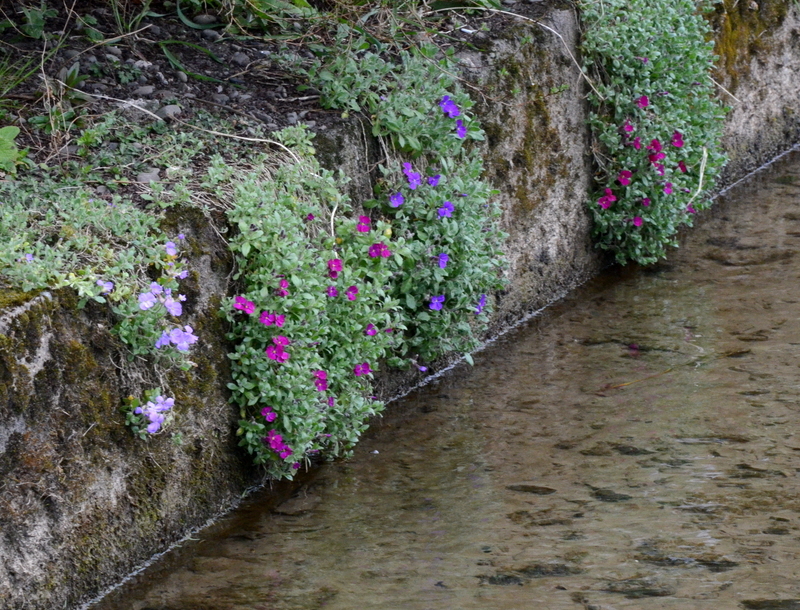 Coming back to the house, I took a picture of some of the aubretia that Mrs Tootlepedal has planted along the dam. Then it was time for a rest…which seemed to last for the rest of the day. It will continue until bedtime as I sit and watch the Masters golf after I have posted this. 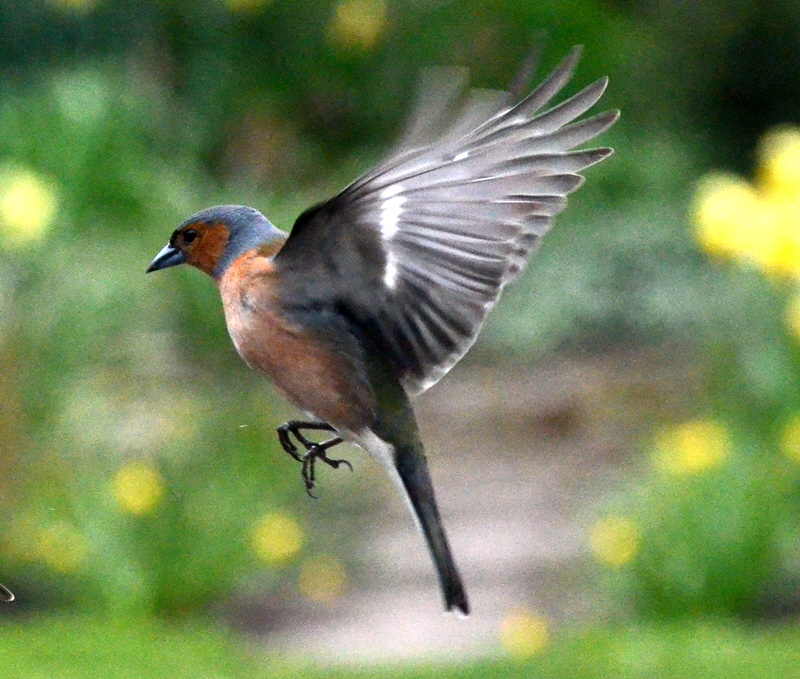 There was a chaffinch of the day.